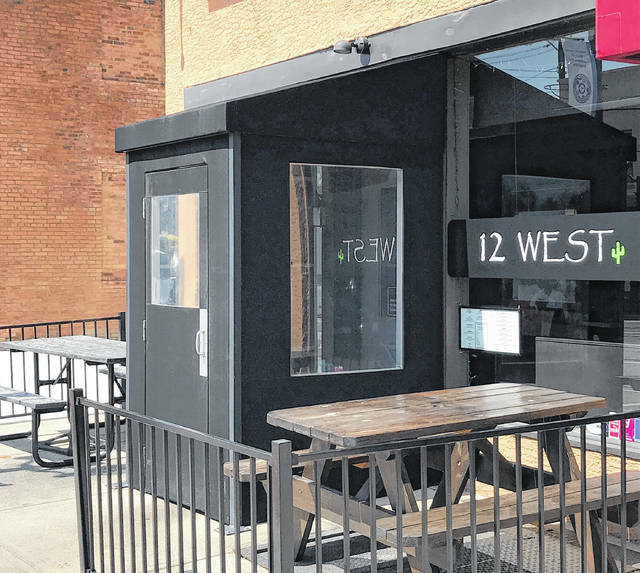 12 West owner David DiStefano received good news on Monday when Delaware City Council unanimously voted to allow the vestibule leading into his restaurant to remain on a year-round basis. The vestibule at 12 West was approved three years ago and was the first of its kind to be allowed in the downtown area. The Delaware Historic Preservation Commission originally allowed the vestibule on a temporary basis, during the winter months, to help combat the cold and wind for customers sitting inside the establishment. The building itself is only 22 feet wide and seats approximately 38 people in a dining space that is about 640 square feet. For patrons inside the restaurant, this means exposure to the elements outside anytime the doors are opened, which is frequent for a restaurant DiStefano said saw 56,962 customers visit last year. But those unfavorable elements extend beyond just the winter cold. DiStefano added the process of taking down and putting up the vestibule costs him $1,000 each time. While the vestibule has been approved for a year-round license, that license is subject to a yearly renewal and can be revoked at any time. According to Planning and Development Director Dave Efland, HPC is seeking guidance from council on how to regulate vestibules as a whole in the downtown district. Much of the concerns voiced by members of council centered around what type of precedent a year-round approval for 12 West may set for other businesses in the downtown area. 12 West is located on William Street and is in the Transitional Sub-District of the Downtown Historic Overlay, not the downtown core that is made up mostly of the businesses that face Sandusky Street. Ultimately, while a decision was made for the case concerning DiStefano and 12 West, no general guidelines were given for HPC to use as regulations for future vestibules. Establishments such as Hamburger Inn and The Flying Pig have expressed interest in possibly adding some type of buffer between their doors and the outside elements, but must wait to see how council decides to regulate the matter going forward.